"THE BAPTISM OF JESSE TAYLOR" This is supposedly based on a true story about a man who found the Lord after years of sinful living. "KIDS GET LONESOME TOO" In the original song by Merle Haggard, he guides the listener to himself. I changed the words to point the listener to God. "THE BEST IS YET TO COME" I wrote this song after leaving a funeral. "OASIS OF LOVE" Truly Christ is a refreshing oasis in the dessert of life. "THE OLD COUNTRY CHURCH" This reminds me of my childhood days. "LIFE'S RAILWAY TO HEAVEN" I loved trains as a child, so this was one of the first Gospel tunes to get my attention. It made me think of spiritual things. "LITTLE IS MUCH" This is such an encouraging song for those times when we think that our contribution to the Lord's work is little. "WAYFARING STRANGER" An old standard that still speaks volumes. "OL CHUNK OF COAL" I added a verse to give it more spiritual meaning. "THE FAMILY BIBLE" A great song written by country superstar Willie Nelson. "ROOTS OF MY RAISIN" This was originally written by Merle Haggard and re-written by me (sorry Merle), to include a personal scene from my childhood. No matter how good you think you are at something, there is always someone better; and in my case, a lot of people, a whole lot better! But, I dont think there is anyone, anywhere, who enjoys playing the guitar any more than I do. My Mother taught me, "Never brag on yourself, and you never have to prove anything". So instead of calling it "A Lot of Pickin" and having to prove it, I just called it, what it is to me, "A LITTLE PICKIN" and let the listener decide. The first tune "SNOWBIRD" is the classic Ann Murray tune that everyone loves and works out very well as an instrumental. The second tune "HELLACIOUS" is an instrumental wrote by Jerry Reed, of Smoky and the Bandit fame and Paul Yandell, friend and guitar accompanist of Jerry Reed and Chet Atkins. It was recorded using a nylon string guitar. The third tune is "WHEELS" a very well known guitar instrumental. I overdubbed the twin part to give it a little punch. The fourth tune is "I GOT A WOMAN" a song made famous by Elvis Presley and Ray Charles. The arrangement is by my good friend, legendary guitarist, Nokie Edwards. Its a goodun. The fifth tune is "WORKIN MANS BLUES" a song written and made famous by Merle Haggard. I worked this arrangement years ago and its a favorite everywhere we go. The sixth tune is "TOGETHER ALONE" a tune recorded by Chet Atkins. I made some subtle changes to the tune to reflect my musical taste. I hope you like it. It is a simple but haunting melody. The seventh tune is "KENTUCKY" a beautiful mountain tune that some say has a Latin flavor. The words are beautiful as well, check them out sometime. The eighth tune is "HELLO MARY LOU" Ricky Nelsons first and most well known hit. My exposure to Rock and Roll guitar comes out in this one. The ninth tune is "THREE LITTLE WORDS" a pop tune that is Chets arrangement all the way. Again I overdubbed the twin part to give it additional flavor. The tenth tune is "WINDY AND WARM" a must tune for every thumb and fingerpicker to learn. After many years it is still a popular tune on the guitar. The eleventh tune is "DANCE WITH ME" made popular by the group Orleans. Chet Atkins once said that it he thought it was one of the most beautiful tunes he ever heard. I use a lot of Chets arrangement and use a few licks of my own. This CD came as a result of a person asking me once what I liked to play, whats fun to play? So I started making a list of tunes that fit that description. I have a computer program called Band-in-a-Box. It plays rhythm and fill parts and lets me play the melody. These tunes can be complicated to play along with, so I dont get to play them often in a jam session, but I sure do have fun playing them with my BIAB. The first tune is "JERRYS BREAKDOWN" a hot pickin instrumental wrote by Jerry Reed. I played the tune on a nylon string guitar, but took a break in the middle using a steel string. The second tune is "DEED I DO" a popular big band tune that adapts well to the guitar. The third tune is "LIMEHOUSE BLUES" a Bluegrass tune written by banjo wizard Don Reno. I played the tune on my Yamaha AES-1500B steel string guitar, but played a break in the middle on the nylon string guitar. The fourth tune is "THE BOXER" a tune that I confess I have never heard the vocal version of . I based my arrangement solely on the one played by Chet Atkins. The sixth tune is "SAN ANTONIO STROLL" a song recorded by Tanya Tucker. My arrangement is a combination of ones I gleaned from different pickers, with a few of my own licks thrown in for good (or bad) measure. The seventh tune is "HONKIN" a tune written by Jerry Reed and taught to me by two of the best guitar pickers I know, Sonny Thomas and Graig Dobbins. Both fabulous Reed pickers. The eighth tune is "THATS ALL" a tune right out of the Kentucky hills. My understanding is that it was written by Merle Travis. The only vocal on the CD. The ninth tune is "I CAN HEAR KENTUCKY CALLING ME" a favorite among guitarist from you guessed it, Kentucky. I think you will like it too. The tenth tune is "SWEET MARIE" a tune I wrote while setting at home with thoughts of what a sweet wife Ive got. Oh yea, her name is Marie. The eleventh tune is "READY FOR THE TIMES TO GET BETTER" a title that I think reflects all of our feelings. This album takes me back to my roots for several different reasons. The Banjo - My Grandpa Denham played a five string banjo and one of my uncles played a tenor banjo. I have played both in years passed, but on this recording I played a tenor banjo in single string and finger style. 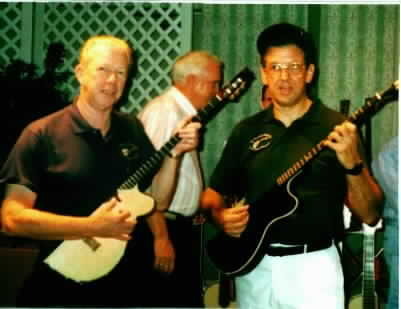 The Mandolin - My father played mandolin, so I naturally inherited a love for this instrument. I'm not an accomplished mandolin player, but loved working on this album as sort of a tribute to my Dad who passed away in 1983. Nylon String Guitar - I love the sound of these instruments, but must confess I have a bit of a time with the wide neck and string spacing. I played a Carlos Robelli on "Cannonball Rag", "Don't Think Twice" and "Summertime". Electric Steel String - This is my first love. I play a Yamaha AES-1500B on the recording. It is a dream to play. Vocals - Like the mandolin and banjo, I don't consider myself an accomplished singer. I inherited a love for singing from my Mother who sang with a Gospel Quartet in church. She went home to be with the Lord a year ago, in 2002. I still miss her.